Korea’s Clean Energy Technology Roadmap marks the milestones for clean energy technology development in order to achieve a low-carbon society, and it helps to realize the energy policy directions of the Korean government. To refocus Korea’s energy R&D on clean energy, 7 government ministries, including the Ministry of Trade, Industry, and Energy and the Ministry of Science, ICT and Future Planning, and approximately 200 experts from industry, academia and research institutes collaborated to established the Clean Energy Technology Development Strategy. The vision of the roadmap is to “convert the new climate regime crisis into an opportunity for economic growth through clean energy technology innovation.” The goals of the roadmap are 1) responding to climate change by contributing to the reduction of greenhouse gas emissions 2) creating new energy business, and 3) leading global technological innovation. We intend to transform the existing market by introducing disruptive technologies that enhance performance, reduce costs, and shorten commercialization time. In addition, through convergence with humanities and social science, we will increase social acceptability that will allow for energy R&D penetration into the market. The convergence of energy technology with other technology will overcome the “Valley of Death” and the “Darwinian Sea”, i.e. market penetration failure. The Korean government is trying to activate the new energy industry. ‘2030 Strategy for boosting New Energy Industry’ was established in November, 2015 in order to meet Korea’s goal to cut back on greenhouse gas emissions and to create a future growth engine that is centered on energy prosumers, low-carbon generation, EV, and eco-friendly processes. 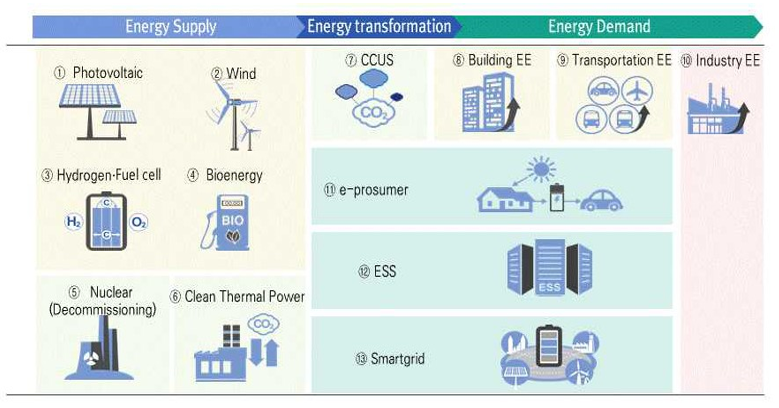 KEPCO (Korea Electric Power Corporation) has also established an investment plan for the new energy industry with regards to smart meters, frequency regulation ESS, electric vehicle charging stations, and energy big data. The roadmap will be implemented to comply with these policies. To shorten the time for the new technologies to enter the market, certification standards and demonstration programs will be developed from the R&D stage. Overseas demonstration based on local and regional environments will be enhanced. For example, through smart-city demonstration which reflects the diverse urban characteristics of each different city, we will execute our specialized power system demonstration, which complies with local regulations, policies, markets, and power grids. We need an energy platform for distributed energy transactions that takes consumers, power capacity, and energy sources into consideration. The eco-system for the clean energy industry will be expanded through the participation of various industry players, including electronics manufacturers, solution companies, and IT companies. We will also make incumbent companies participate in materials technology for new energy industries. The basic direction for investment in clean energy is to put priority on areas, in which technical competitiveness for commercialization can be achieved by 2025. The government (create new industries) and state-owned enterprises (provide stable supply of power) will each play a different role in this process to increase the investment effectiveness. The level of GHG emission reduction, market potential, competitiveness and government policy on clean energy technology were reviewed to select the 6 main areas and 13 technologies. 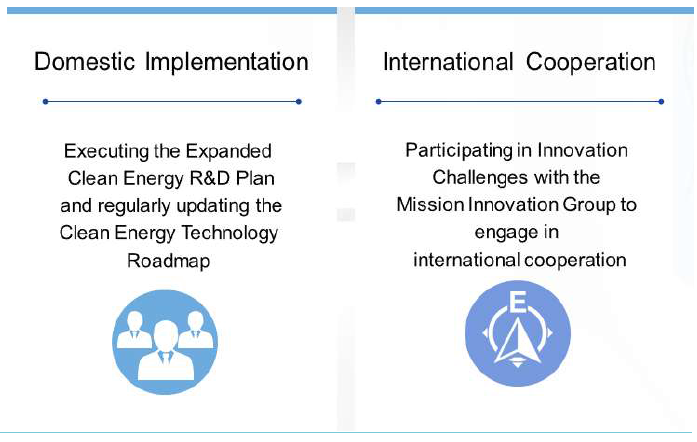 For each focus area, the government established a Clean Energy Technology Roadmap with 67 strategic tasks and 283 core technologies to set milestones for the development process. In the technology development strategy for focus areas, the government defined the specific area of application that reflected market demand; the strategic agenda including the goal of the technology; and the core technology for which the government, SOEs and private sector should each respectively take the lead in development, in order to highlight the areas private-sector investment was needed. 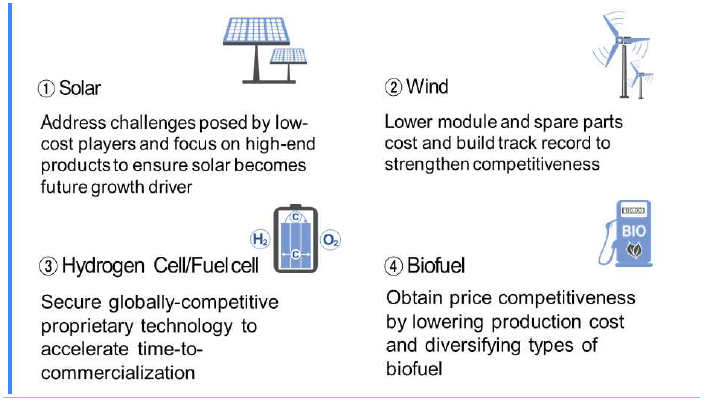 In renewables, the strategy for solar is to become more cost competitive, so that solar power can be deployed more widely, and to develop a wide variety of solar modules that can be used to encourage distributed energy generation. For wind, the strategy is to make the industry more competitive by developing the technology to optimize the overhaul and operation of wind farms and the technology to run 6-8 MW level large-scale wind capacity. For hydrogen cells and fuel cells, the focus will be to improve the efficiency of fuel cells used for buildings, power storage and transport; and to build the infrastructure necessary for the production, storage, transport of hydrogen, and build-out of hydrogen stations. In the bio area, the aim is to increase the competitiveness of bio energy by securing the technology needed to create carbon-neutral bio processes and bio power plants that will replace fossil fuel. For the area of efficiency improvements, the strategy for industry is to integrate the management of energy, which is currently consumed dispersedly, and to develop high-efficiency process technologies that can be implemented in energy-intense industries. In the transport area, the government is planning to focus on improving the efficiency and functionality of next-generation EV, while also satisfying the requirements of stronger environment regulations in the global transport sector. For buildings, the strategy is to develop key parts or materials needed to build zero-energy buildings, and embark on future convergence technology, such as community network technology. 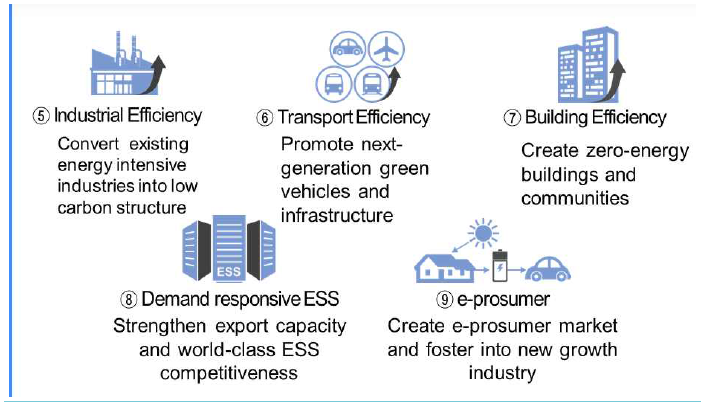 In terms of demand management, for ESS, the strategy is to develop stable and longer-life, large-capacity energy storage systems, and to develop and demonstrate ESS services to gain market competitiveness. To encourage more E-prosumers,* i.e. those who can directly sell energy in the power exchange, the government plans to extend participation by ICT companies and start-ups, and to establish a market exchange regime and infrastructure fit for more distributed energy resources. In the area of thermal transmission and distribution, the government wants to build a smart grid which will improve power supply efficiency and capacity factors, and provide more system stability and social acceptability. Clean thermal will include acquiring next-generation technology to build high-efficient thermal power plants and localizing the key machinery needed to build gas-based combined cycle power plants. In the area of nuclear energy, the Korean government wants to secure decommissioning technology in order to use nuclear power in a safe and sustainable manner. Lastly, for CCUS the strategy is to create new industries utilizing CCU and then try to extend it one step further by demonstrating integrated CCS which includes carbon capture, transport and storage. Going forward, the Korean government is committed to executing this investment expansion plan and technology development strategy for focused areas to improve existing technology, save costs and accelerate the time-to-market. In addition, we plan to update the Clean Energy Technology Roadmap every 2-3 years to reflect changes in market trends. Mission Innovation member countries emphasize international cooperation to facilitate information sharing and accelerate clean technology innovation. To this end, there are subgroup activities and innovations that have been identified. Korea has established a framework of cooperation with partner countries, with which it is either engaging in joint research or is preparing to do so. Through the Mission Innovation platform, the Korean government plans to develop joint R&D projects with countries that have similar needs and actively engage in cooperation. View the Republic of Korea Clean Energy Technology Roadmap as a pdf. The increased investment will be mainly used on clean energy technologies: renewables, energy efficiency improvement, clean thermal power, smart grids, carbon capture, utilization and storage (CCUS), energy storage systems (ESS), and nuclear power. The Korean government sees the clean energy technologies for a new growth engine, and is thus devoting efforts in clean energy industries to develop and demonstrate business models using clean energy technologies. Investment in clean energy technology will be shared by the government and public enterprises so as to enhance investment efficiency. In particular, the government will focus on CCUS, renewables, demand management, and energy efficiency improvement, while public enterprises will concentrate on clean thermal power, transmission and distribution, and nuclear power.